I'm back, or if this is the first time you're seeing this, welcome. This is my third update about my latest challenge. For those of you new to receiving these updates – here's the deal: I've taken on the challenge of completing an epic endurance event with the purpose of raising money to fight Leukemia and Lymphoma. I decided to take up this challenge in honor of my mother-in-law, Margie Griffin, who passed away from leukemia last August, and my friend Stacy Bowman, who is a leukemia survivor. My goal is to raise $7,500 to benefit the Leukemia and Lymphoma society through the Team in Training program. 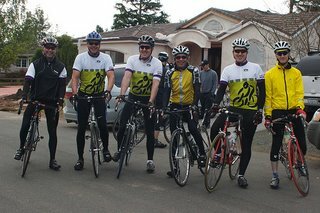 My personal challenge is to complete the Tour of the California Alps, also known as the Death Ride – a one day, 130 mile ride, climbing 15,000 feet, over 5 mountain passes. I’ve been remiss in writing, it was our company’s end of quarter, the company was acquired by SAP, and we held a customer conference for 400 people, we started remodeling our kitchen and family room, I’ve made trips to Las Vegas, Philadelphia, and Nashville, and I’ve been squeezing training rides and trips to the doctor in between all of that. It’s been quite busy. Here’s a quick update. Since the last time I wrote, our coaches have found new sadistic ways to torment us. Four weeks ago we rode 65 miles in the hills on the San Francisco Peninsula. It was cold and wet. Three weeks ago, we rode 70 miles in the Berkeley Hills. It was cold and wet. Two weeks ago we rode 75 miles in the hills of Marin County. It was cold and wet. This last weekend we rode 78 miles on Saturday. It was cold and wet. On Sunday, I rode 104 miles. It was cold and windy, but not too wet. In case you haven’t picked up on it, there’s a definite pattern to our sadistic adventures… we always ride in the hills. Each ride gets hillier and longer. And as hard as the rides are, there only half of what the Death Ride will be. In the picture, I'm the third on the left. This is the group with whom I've been training. If they all look faster than me, it's because they are. Last Sunday’s ride was called the Primavera Century. I’ve concluded that “Primavera” is Latin for “wind in your face”. So not only was it cold and sometimes wet, the wind was blowing at least 20mph for much of the way. The wind pattern in the east bay is that it doesn’t start picking until the afternoon. So in the morning, when I was supposed to be riding with the wind, it wasn’t blowing me along. When I turned around and headed back to Fremont from Livermore, it was blowing against me the whole way. Wind is just nature’s way for providing hills for people that live in flat areas. I’m pleased to say I’ve hit the $6,500 level for my fundraising efforts. Thanks to everyone who has donated. As I said in my previous email, I’m shooting for $7,500. As a special offer for anyone that donates over $100 in the month of May, I am offering a bike tune-up (parts, if needed, not included). I've resurrected a few bikes that have been in disrepair. I'm sure I can help you out. Rule #1 – When riding down hill, keep your mouth closed…tightly. There is nothing worse than when you’ve just finished a climb and as you’re catching your breath going downhill, you swallow a bug. Usually a bug in the mouth is easily remedied with some convulsive hacking and spitting and a healthy assortment of expletives. Rule #2 – When you have to spit, spit to the right. Spitting is usually caused by a bug in the mouth, see rule #1. Savvy riders know to pass on left. But since your mind is usually occupied with other thoughts, you won’t be aware that they’re trying to pass you. Therefore spitting to the right is simply good manners. As a general principle, other riders don’t like to be spat upon. They will either think that you’re rather impolite or you are from England (where they ride on the wrong side of the road). They may retaliate by spitting back, squirting you with their water bottles, or other rather disgusting tactics. The exception to this rule is when you’re passing someone. In which case, spitting to the right is very much frowned upon. Then they’ll think you’re boorish or a professional rider from France. In which case, you better ride like a professional rider, because the response is likely to be most unpleasant. Rule #3 – Always pass on the left. If you don't know why, you haven't been reading. Rule #4 – When traveling downhill, zip up your bike jersey. Three times I’ve had bees fly into my jersey. It’s pretty unpleasant too. No, I have never had a bee fly into my mouth. The worst incident was when I was traveling down a four lane highway at 50mph. Traffic was still passing me and I didn’t have a safe place to stop. Usually when something is stinging you, you grab the area of your jersey in the vicinity of the stinging you bunch it up in your hand and try to squish whatever it was that was stinging you. By the way, it’s always good practice to wear a colorful jersey; it hides the squished bugs better. Anyway, while traveling at 50mph, taking a hand of the handlebar is not a good idea. The bee stung or bit me three times before I could stop. More useful tips to come in future updates. I’m sad to say that the ongoing back treatments have been ineffective. I can ride my bike, I just can’t walk or lie down without significant pain. The doctor is scheduled to do a “discogram” next Monday. One would think it’s a singing telegram that specializes in Bee Gees songs. Instead, iIt’s a detailed analysis of the disks in the back to determine exactly what the problem is. Until then it’s ibuprofen every four hours. Thank you again for your support. Stay tuned for future updates.